One of the biggest challenges homeschool moms face is teaching subject matter to their children that they themselves never understood. I’d be rich if I had a dollar for every mom that said to me, “I was horrible in math. I don’t remember any of it. When my child gets past 4th grade, I’m done. I’ll have to put them in school.” That’s where A+ Tutor Software comes in. Ladies, it’s like having a math teacher right in your own home! 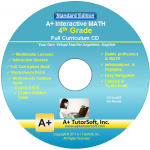 It’s a truly wonderful full math curriculum for grades 1-8 on your computer!